Well, with all the excitement about the Federal Fall Economic Statement yesterday, the release by Statistics Canada of the 2017 homicide numbers flew in somewhat under the media radar. 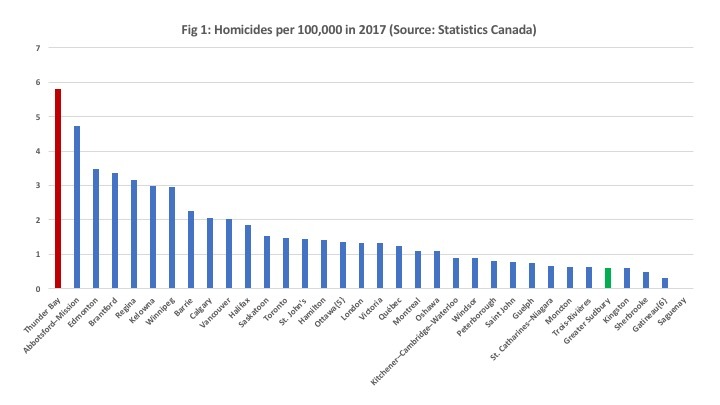 According to Statistics Canada, the homicides in Canada hit its highest rate in almost a decade in 2017 with much of the increase attributed to more firearm-related and gang-related incidents. The firearm-related homicide rate increased 18 percent from 2016 to 0.72 per 100,000 population—the highest rate since 1992. Police reported 660 homicide victims in Canada in 2017, 48 more than in 2016. The homicide rate rose 7 percent in 2017 to 1.80 victims per 100,000 population—the highest level since 2009. It would appear that the upward increase in homicide rates was driven by British Columbia and Quebec. What is also of interest is the homicide rate by CMA for 2017 as shown in Figure 1. In 2017, the homicide rate per 100,000 ranged from a high of 5.8 in Thunder Bay to a low of 0 in Saguenay. Greater Sudbury came in close to the bottom at 0.61. The good news for Thunder Bay is that the homicide rate for 2017 is down from 2016 when it stood at 6.62 per 100,000. 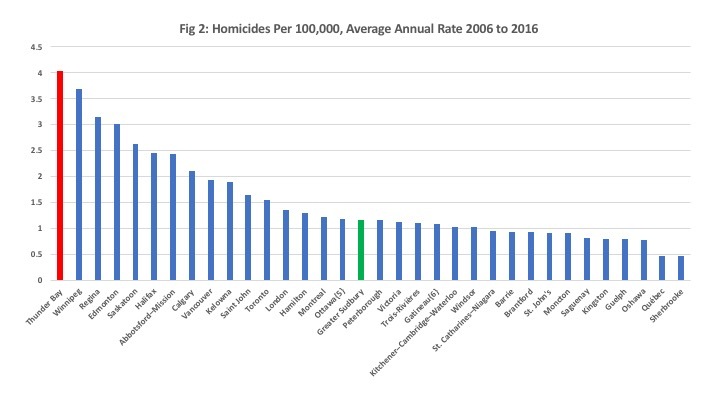 The bad news is if one takes the average homicide rates for all CMAs for the period 2006 to 2016 (see Figure 2) Thunder Bay also ranks the highest at an average of 4.04 per 100,000, just ahead of Winnipeg at an average of 3.69. As for Sudbury, its homicide rate is up from last year - when it stood at zero - but given the rankings there does not seem to be that much to worry about there. Needless to say, despite an improvement in 2017 Thunder Bay still has work to do. 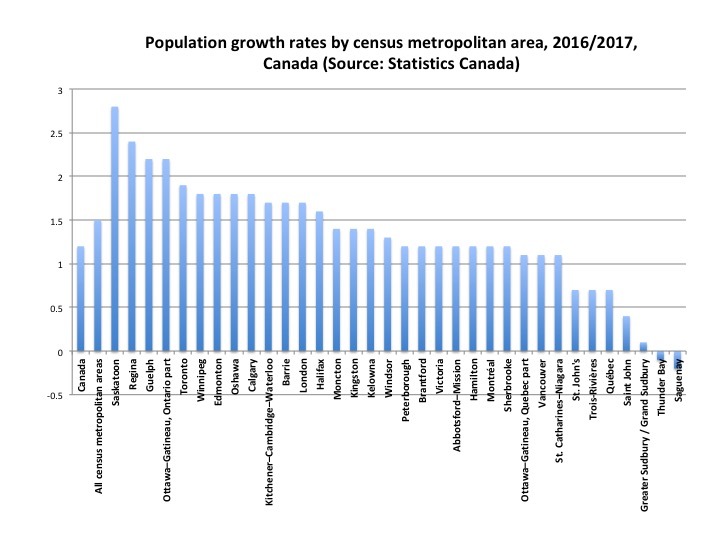 Statistics Canada has released its recent sub-provincial population estimates for 2016/17 and the results find that population is still growing faster in the Prairies well as parts of Ontario but the two major northern Ontario CMAs are not in the pack. According the Statistics Canada, the 10 CMAs with the highest population growth in 2016/2017 were in either the Prairies or Ontario. In 2016/2017, the population growth rate was 2.0% or higher in four CMAs: Saskatoon (+2.8%), Regina (+2.4%), Guelph (+2.2%) and Ottawa–Gatineau (Ontario part) (+2.2 and were followed by Toronto (+1.9%), Oshawa, Winnipeg, Edmonton and Calgary (+1.8% each), and Kitchener–Cambridge–Waterloo (+1.7%). The figure below shows the picture pretty clearly. At the bottom of the rankings are Sudbury, Thunder Bay and Saguenay. 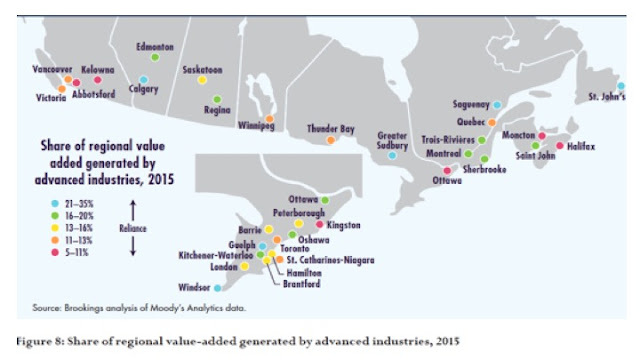 Sudbury is third from the bottom with a population increase of only 0.1 percent. The population decreased in the Saguenay (-0.2%) and Thunder Bay (-0.1%) CMAs for the fourth consecutive year with Saguenay’s population decrease partly attributable to out-migration of young adults aged 18 to live elsewhere in Quebec. In Thunder Bay, the number of deaths surpassed the number of births, and has done so since 2006/2007, contributing to its population decline. Employment is always an important indicator of economic growth and success and the figure below provides a good perspective on how some of Ontario’s major centers are doing when it comes to job creation. Employment data from Statistics Canada is used to compare total employment growth between 2001 and 2016 for 15 major CMAs. These major CMAs are ranked from highest to lowest and their employment growth ranges from a high of 38.8 percent for Oshawa to a low of -2.4 percent for Thunder Bay.